Like many parents in 1970, the gulf between Mad Men’s rebellious Sally Draper and her uptight and out of touch parents has grown as wide as the Grand Canyon, that great natural chasm that Sally might visit on her summer teen tour. 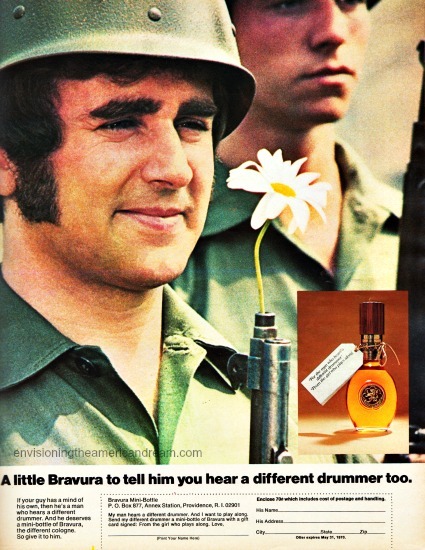 At the same time, the real Mad Men of Madison Avenue were working overtime to close that generation gap by producing ads that appeared “relevant,” distancing themselves from the cop-out generation that produced war, prejudice and greed. No more coloring in the lines. By 1970 the grey flannel suit gave way to the powder blue leisure suit, as advertising itself was swinging to a different beat . 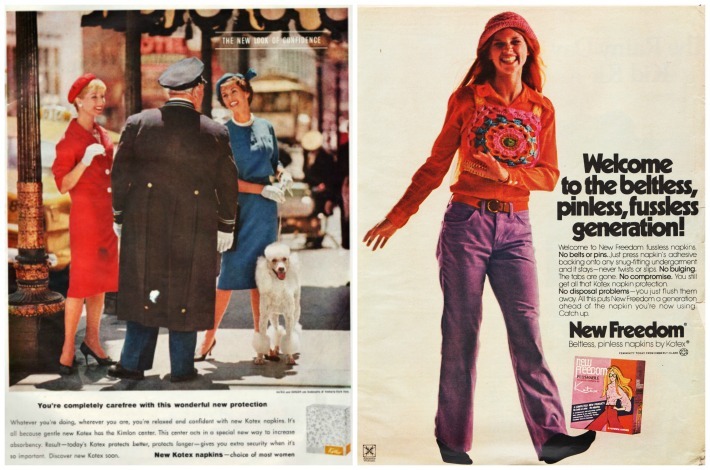 By 1970 Madison Avenue went on a teen tour of its own to attract the youth market. 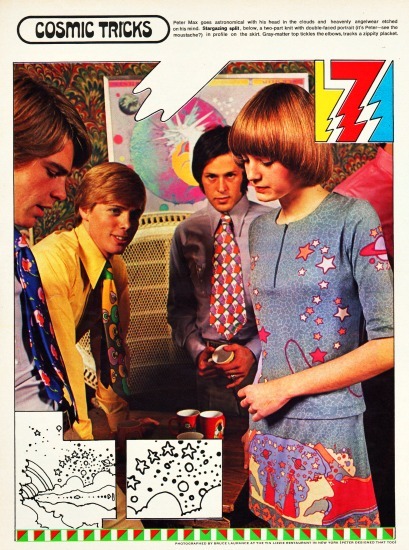 By donning their colorful silk neckerchiefs and groovy bell bottoms the creative ad men assured their clients that their agency was tapping into the cultural zeitgeist, keeping it real by shifting their focus to the groovy, individualistic now generation of consumers. At times it seemed the manufacturers were having their own identity crisis. Trying desperately to bridge the generation gap, these middle-aged men sporting mutton chops and Fu-Manchu mustaches in order to appear hip, shamelessly sought out the youth market with sometimes laughable results as they attempting to make their establishment products hip to the very anti establishment, anti materialistic teenagers committed to doing their own thing. Marketing in the Age of Aquarius provided some astronomical profits in return. Where better to target teens than in Seventeen magazine a publication devoted to their very needs and desires. 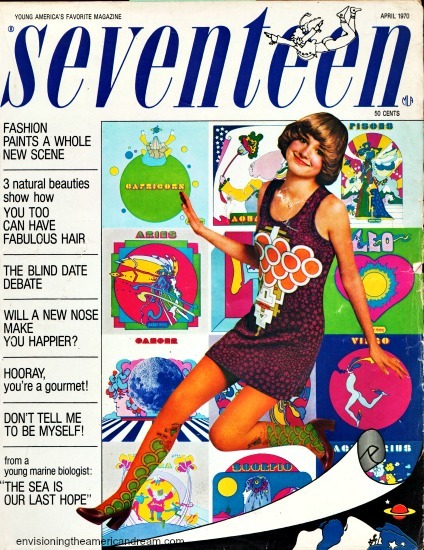 The inch thick wish book of teen fashion, style and beauty was the undisputed authority, sanctioning looks and desires for the sassy non-conformist 1970 teen. Encouraging teens to “Be an Individualistic! Go where the experience awaits you !”the magazine was a kaleidoscope of psychedelic colors and catchphrases, filled with ads hawking the same products they had for decades only now catering to the readers individuality, rebelliousness and hedonism, while incorporating relevant trends like women’s lib, Vietnam and ecology. No one combined peace, love and commerce better than Peter Max. 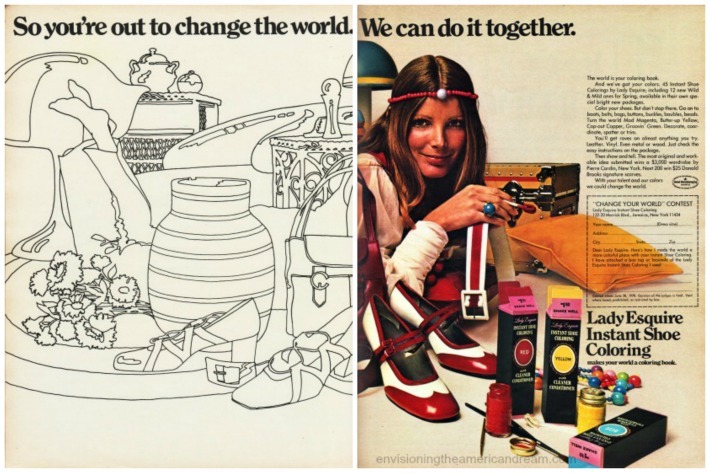 The former Madison Avenue wiz kid was a wizard of marketing, . 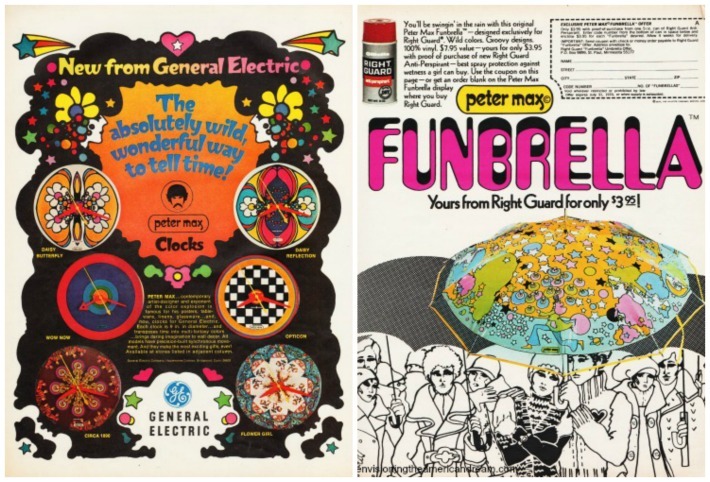 His ubiquitous designs of heavenly influences could be found everywhere from clocks to clothes, all espousing harmony love and Max-imum good vibrations. No doubt his horoscope predicted major profits. 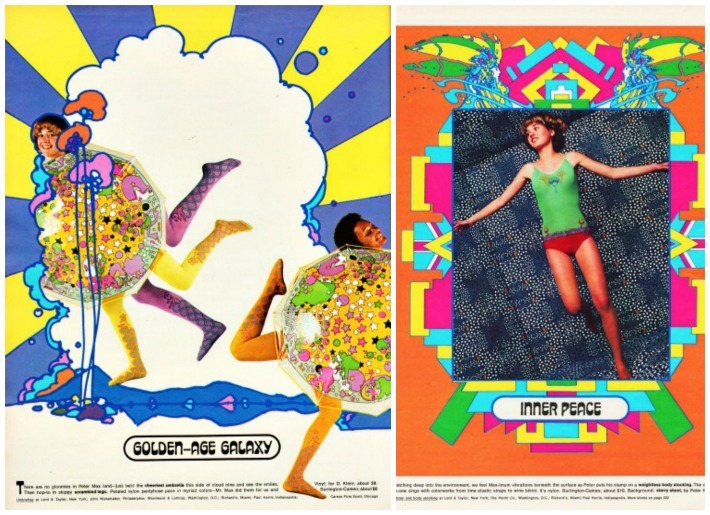 “There are no gloomies in Peter Max land-just twirl the cheeriest umbrella this side of cloud 9 and see the smiles Inner Peace is achieved by stretching deep into the environment we feel Max-imum vibrations beneath the surface as Peter puts his stamp on weightless body stocking. The cling-a-ling all in one zings with colorworks. 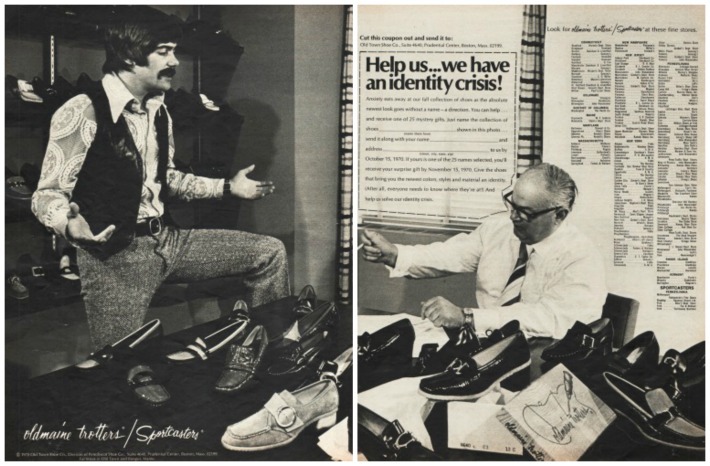 Trying to attract a younger audience for their shoe polish ( now rebranded shoe coloring) Esquire was no longer just for your establishment Dad’s corporate wing tips or your Moms died to match satin pumps. 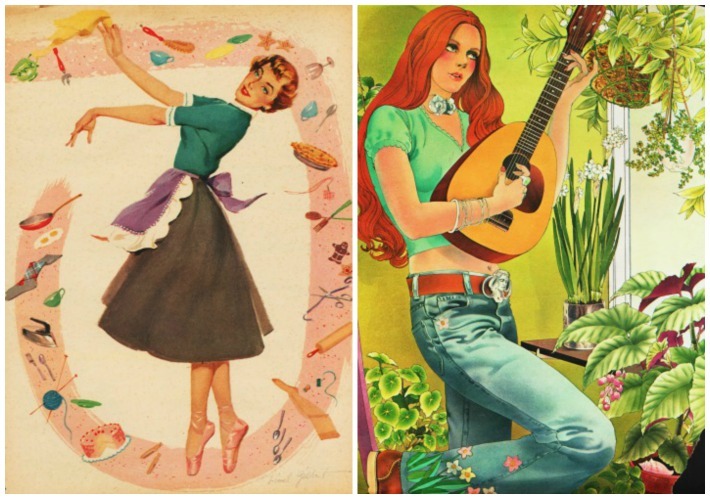 With Lady Esquire Instant Shoe Coloring – you could be creative and make your whole world a coloring book in groovy colors like Cop-Out Copper, Butter Up Yellow and Groovin Green. Rejecting tradition, these teens would rather die than end up like their uptight cookie cutter parents. 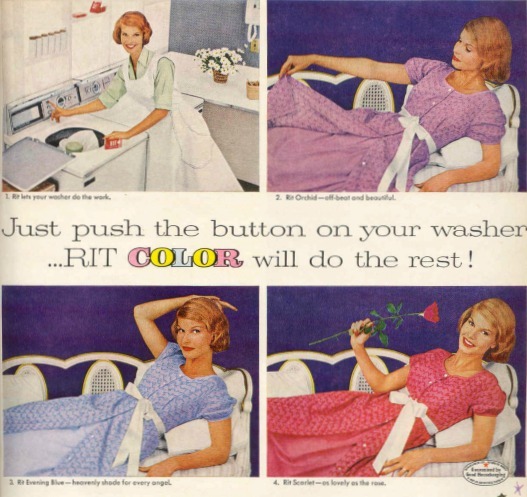 Old reliable Rit fabric dye found a whole new generation of consumers. No longer just for Mom’s organza curtains, or that new shirtwaist dresses, with a bottle of familiar Rit fabric dye you could create a total tie-dyed world. 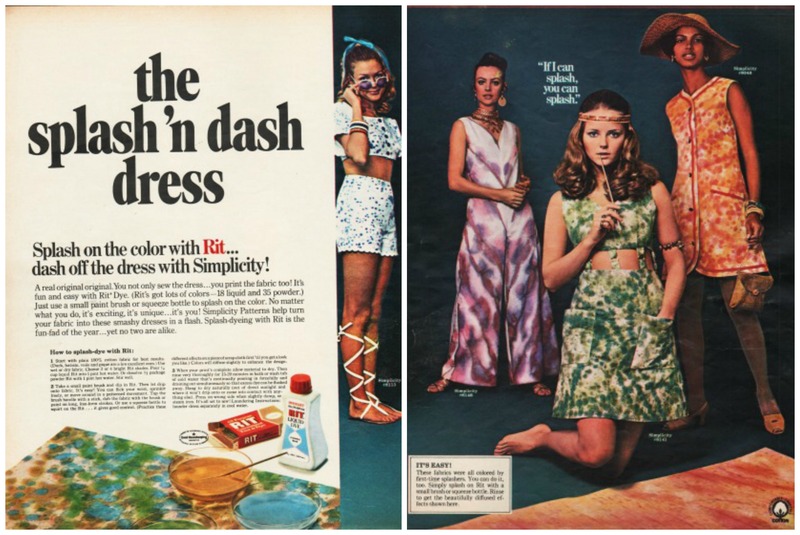 1970 Rit Ad features simplicity patterns for some groovy threats as shown on model Cheryl Tiegs. Unleashing your inner Jackson Pollack was never so easy. Hoping to charm a new generation of consumers. Monet jewelry went out to prove that even a non materialistic hippy chick could still dig that 1950’s charm bracelet. 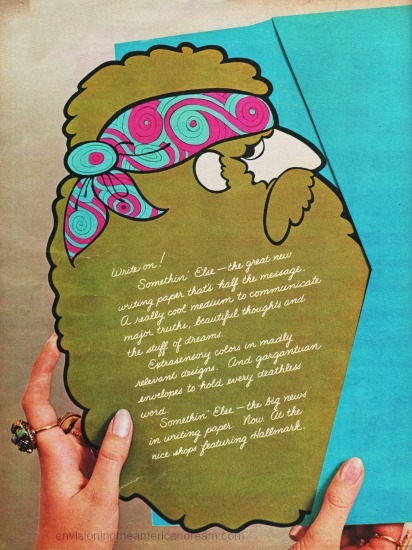 A frequent advertising device was to simply slap on a leather headband on a pretty model and instant hippy. This Woodstock wannabe is incongruously still sporting a charm bracelet, an oh so feminine piece of jewelry, dangling with the decorative pendants and trinkets that chronicle the small moments in a life. Unless Monet intended to create trinkets marking a first acid trip, Grateful Dead concert or a miniature gold protest sign, its success seems doubtful. Kotex sanitary napkins beckoned the liberated teen to catch up and become part of the hassle free generation. This was the new, newer look of confidence. Getting your period was a hassle, man. But now with Kotexs New Freedom there was no hassle . Out went the old-fashioned sanitary belt. 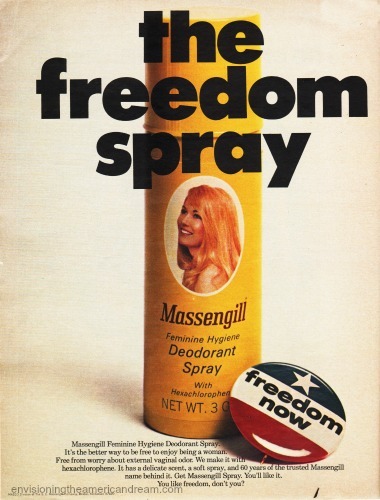 Feminine hygiene spray was no longer just for married ladies; it was the now experience to show the world you’re with it! The way out weighs in! Exercise your option to lose weight even if being slender wasn’t really optional…fatso! Madison Avenue knew it was important to harmonize with the world and keep in tempo with whats real. 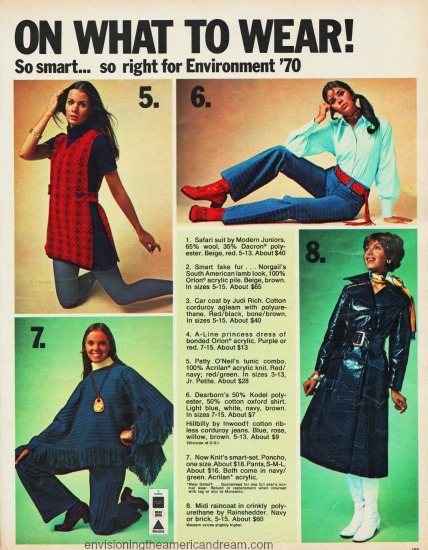 Nothing said back to the earth authenticity like a non biodegradable polyester/ peasant blouse made from petro chemicals. They may have been wearing polyester but they were down to earth in their hearts. The environment was on everyone’s mind. Even back to nature chicks needed to powder their meaningful teenage noses. Corn silk brand makeup came to their rescue. 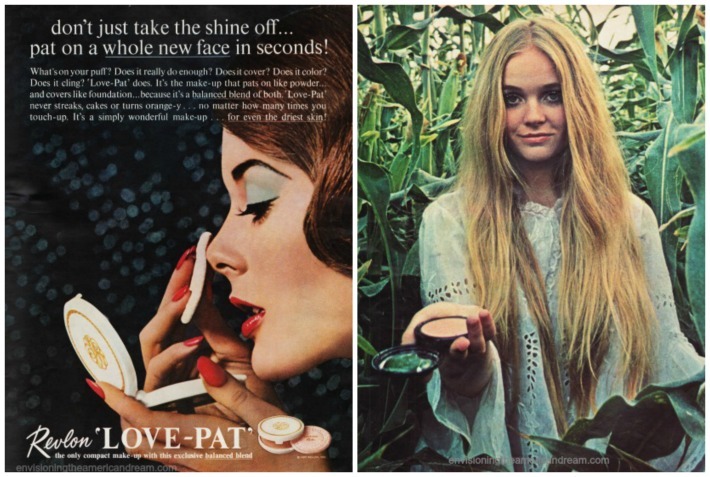 When corn wasn’t being used for high fructose corn syrup it was pressed into service as face powder. A really cool medium to communicate major truths beautiful thoughts and the stuff of dreams. Hallmark got hip with their stationary making it easier to get down and tell it like it is! “The great new writing paper that’s half the message. Extrasensory colors in madly relevant designs. This ad appeared one month before the tragic protests at Kent State when Ohio National Guard fired into a crowd killing 4 and wounding 9 students. Sadly, there was not a “different drummer” among the soldiers that day. What a find! Thanks for sharing this vintage magazine. (P.S. Shoe coloring was not the same as shoe polish — it was an opaque paint that would actually change the color of the shoe, until it wore off.) 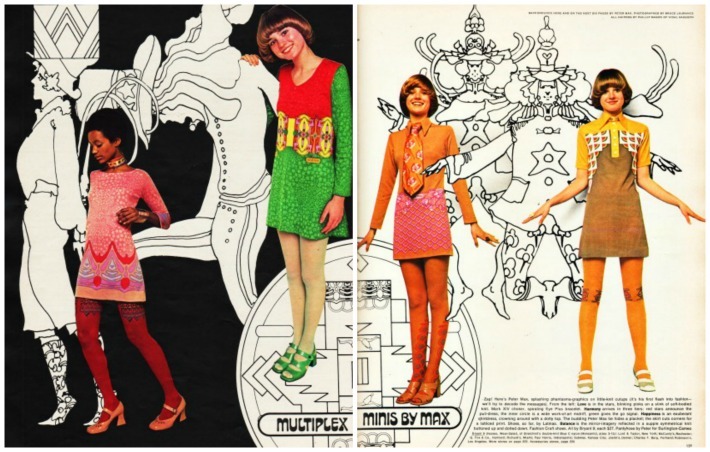 Great pictures of a time I remember — and wasn’t Peter Max a clever guy, mass-merchandising hippie culture and still seeming cool enough for the Beatles! I remember seeing his prints (or knock offs) on polyester knit dresses sold on Haight Street. I think I owned one. Thanks for the clarification about the shoe coloring vs shoe polish…I kinda knew that, but wanted to play with the idea. 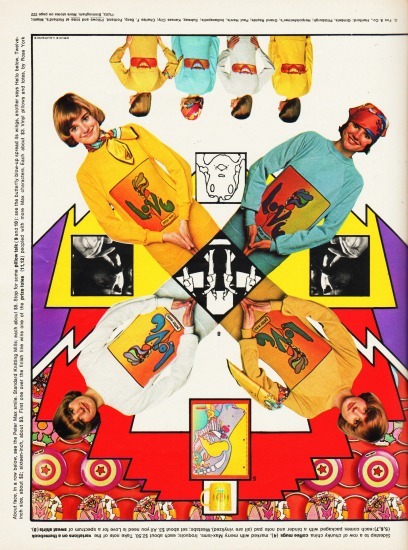 Until we maxed out on Peter Max, he made a fortune. Great piece. I am often amazed at how much material you have. Thanks Don. I have been an incurable collector forever and am grateful for the digital age to be able to share and utilize all the material I have at my fingertips. 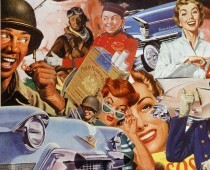 Seeing all these wonderful memories in such vivid color and designs of a fantastic period in time is just so cool. You are the wealth of archival eye candy! I love any Peter Max because of his great style, use of color and drawing of shapes. 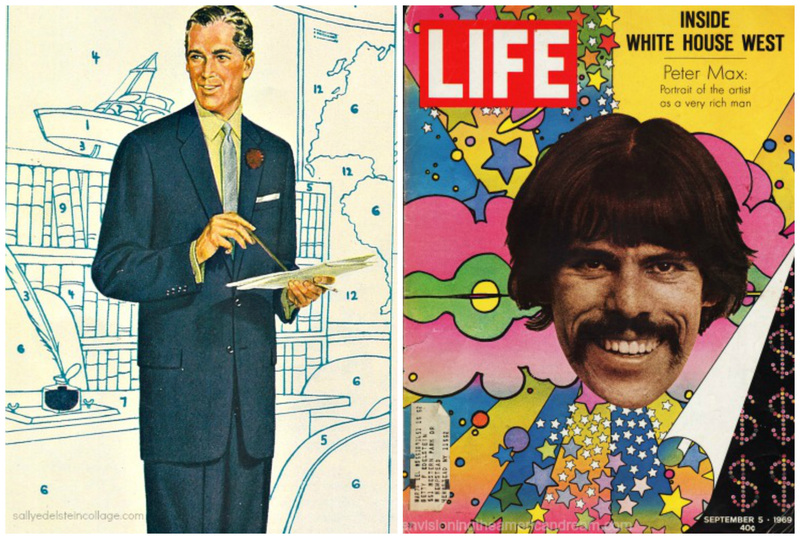 I think it’s so cool that the Peter Max Life mag came to your very own house in 1969 and you still have it. So glad you enjoyed it. I agree with you, the colors and kaleidoscope of designs are so evocative and distinctive to that time period, unique to itself. Being a collector from the time of childhood, I am surrounded by the ephemera and objects of the past.